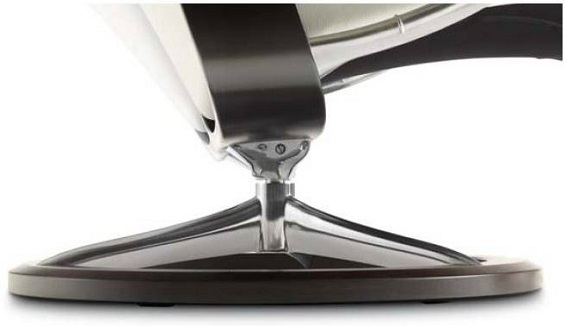 Stressless Signature Series Wing Recliner and Ottoman- Guaranteed Delivery from Unwind. Have you taken a look at the following Wing recliner accessories? The simple Swing Table, the ultra-convenient Personal/Laptop Table, the useful Ellipse Table, the stylish Urban Table, or the fan-favorite Elevator Ring set. Our guaranteed low pricing is reflected automatically when you make your leather/fabric selection from pull down menu above titled: "Select Leather or Fabric Type and Color". Need assistance- Please call 1-888-486-9463. The Stressless Wing Recliner can be purchased in a wide variety of leather and fabric types and colors. To view any of the amazing leather and fabric choices, simply use the pull down menu above, which is titled: "Select Leather or Fabric Type and Color". The price of Wing Recliner will change base off of the leather or fabric type and color chosen. Can't find the right color or need help? Call 888-486-9463 to speak with an Ekornes Furniture Specialist for further assistance. Enjoy Fast, Worry-free Delivery on a Stressless Wing Signature Recliner and Ottoman. Start relaxing in your beautiful new Wing Signature Recliner and Ottoman sooner with our Quick and Easy Shipping Methods. It's a great time of year to purchase from the amazingly comfortable, Stressless Signature Wing Recliner line! This popular, modern recliner delivers exquisite head, neck and back support and the over-stuffed smooth, soft, cushioning allows you to sit undeterred for many hours on end. The Stressless Wing Signature recliner is among the most modern and padded Stressless recliners available. Click here if you want to view the traditional Stressless Wing Medium Recliner and Ottoman with the familiar wooden hourglass base. Ekornes is also introducing a new Full-Grain Leather called Noblesse. This is the absolute, most-exclusive leather grade offered by the manufacturer. It is through dyed so it will retain it's color for decades to come. During the tanning process, only the faintest touch of protective lacquer is applied to the leather's surface. This allows the natural softness and luster to glow without hindrance. Some might even say that Noblesse is softer than the former Royalin Grade Leather. The natural grain and texture have been retained the tanners do not correct the surface of the leather. This means that minor color nuances and skin blemishes may occur. This grade is the most delicate and therefore vulnerable to UV exposure and spills/stains. 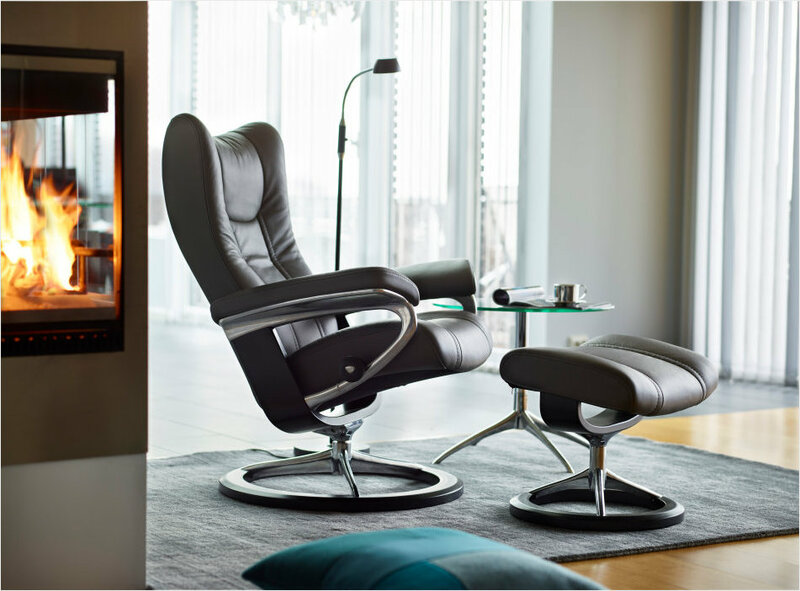 Choose your Stressless Wing Recliner with Signature Series Base and get Noblesse leather to top it off. The Stressless Wing Recliners match the Wave Series Sofas perfectly. They accent nicely with the Arion Sectional Options as well. When the Atlantic and Pacific Recliners by Ekornes were discontinued last year, the Wing was introduced to match the sofas that remained. Check out our selection of Stressless Wave and Arion Sofas to find your matching furniture set. Choose PayPal Credit for their flexible payment options and familiarity when purchasing the fantastically comfortable Stressless Wing Recliner. Finance your purchase, relax with flexible payment options and pay the balance off over time. Remove the pressure of shopping and truly relax and unwind. Easy Payments with PayPal Credit lets you get the comfortable Stressless Furniture when you want it, and budget your payments as you go. You can choose the monthly payment amount and the length of time that works best for you. After all, who know you better than you? Pay with peace of mind. PayPal will notify you when each monthly payment is due, so all that’s left to do is sit back, relax, and enjoy your purchase. Stressless Recliners by Ekornes of Norway are the only furniture line to be endorsed by the American Chiropractic Association. This is the largest Chiropractic Association in America. It is based in Virginia and serves as the national voice for the profession. The official announcement was made in 2002, but we wanted to remind you that when you choose a brand-new Stressless Signature Wing Recliner, you are not only choosing style. You are choosing a back-healthy seating system. Plus System- allows the head rest of your new Ekornes Wing Signature Series Recliner to come forwards slightly as you recline in your seat. This allows you to easily carry on conversation, maintain eye contact with the television or enjoy a snack. I have for years been eyeing Stressless recliners. I have a friend who has one of these babies. I made the mistake of going to look at them in person.”BOOM” SOLD. Love,love it. Yes expensive, but worth every penny. I made a huge mistake. I purchased a different chair. This was a big mistake because the chair was not a good fit for my body shape. I gave that chair away after being completely disappointed with the fit and comfort. This chair is just unbelievabley comfortable. Build quality is first class,as well the design. Expensive yes, however if you want the best recliner on earth go no further. This is the best... bar- none .